Idealistically each rooster should have 6-12 hens but will be happy with 1 or 2. However, if you have a very randy rooster and he only has 1 hen you may need to separate them for a few hours each day to give the hen some rest. Rooster's have very simple but specific mating ritual's that are the same with all breeds. Feeding the hens-Rooster's will find a tasty tidbit and chirp excitedly to coax the hens to him. Courting- The rooster will hold one wing down and circle the hen as if flaunting his brilliant plumage to impress her. Chasing-Sometimes the Rooster will chase a hen that plays hard to get. Hens that refuse the rooster-Hens that run from the rooster and refuse to squat will make the rooster upset and he may get a little rough trying to get them to cooperate. In the end the hen will squat and the rooster will get the girl one way or another. 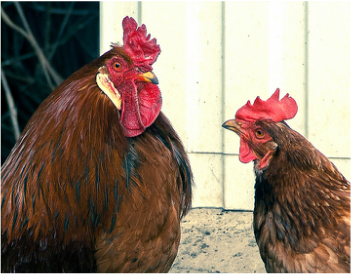 Hens need a break-Hens need a break from roosters when they are molting or if they do not want to mate. Too much mating can cause eggs to get stuck inside of the hen and stress the hen out. If you do not have at least 6 hens for your rooster you will need to separate him from the hens sometimes.